The weather looked promising, the plan was in place, and I was packed and ready to go. Ken and I started our adventure off at the St. John's United Church men's group breakfast in Sussex Corner (http://www.sussexcorner.com/). We needed some good fuel for the challenge we had laid out before ourselves and thought their breakfast would suit our needs. After a big feast of bacon, eggs, hash browns, toast, donuts, and of course all the tea or coffee we could drink we were set. We loaded the gear into the car and headed for Millbrook. We had no trails to follow for the first leg of this trip, instead we were going to bushwhack our way along the west ridge of the Mill Brook valley to a small cirque. This proved to be more difficult than anticipated as we struggled on our snow shoes due to the hard, slippery, crust on the side hill. Even our crampons couldn't keep us from sliding down the slope from time to time. Eventually we made the cirque and from here enjoyed the view and watched as a large deer browsed in a logged clearing just above us. From here we dropped down into the valley and crossed a bridge before heading up the east ridge toward Misty Mountain. The walk up the east ridge took us along the Cotter Holler Stream. I always enjoy this walk as this is a picturesque area. The walk up this ravine is steep and tiring and we are rewarded when we reach the top with the sight of approximately a dozen deer. As they scattered we stop and catch our breath and take in the view back across and down the valley, before heading towards Misty Mountain. This is a frustrating portion of the trek as we can see into Hidden Valley but the steepness of the valley walls here prevent us from just going over the side. We were forced to continue our walk along the ridge until we reached a logging road that now provides easy access into Arnold's Hollow. After a short walk on this road we jumped off into the woods again and I was able to find the old trail that used to serve the old settlement in the area. We walked along this small stream further into the valley. As we neared our destination we became excited as the sun was shining bright and the weather was clear and warm for a March day. 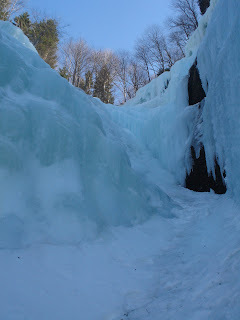 We went through the two upper meadows with a plan of going into the "amphitheater" to view the ice walls. Neither Ken or I had seen them before and were eager to view this wonderous, natural, locale. 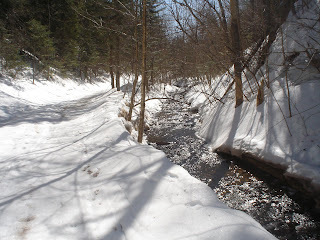 The ravine was somethimes treachorous to negotiate as you were always walking on the ice. We were not climbers and therefore had no crampons to provide good footing with. Really it was quiet humorous as we laughed at each others mis-steps. Once at the ice walls though it was silent as we gazed at the immensity of it all. I'm sure there was enough ice there to fill the Montreal Forum at least 50 times. There were climbers on the wall as well as a couple resting. We chatted briefly and I decide that I need to look into climbing a bit more seriously. One of the climbers provides me with a group to look into. (http://www.unbf.ca/clubs/climb) I think I will try to at least attempt to wall climb a bit more in the future. I have done so in the past and enjoyed it but other priorities have meant that I don't have the time to put towards it. After seeing this place I may need to change my priorities. The walk down this little ravine was also very entertaining as we do our best to ski or skate down. Ken proved to be much better at this than I as I slipped and fell a couple of times, once gliding awkwardly down the ravine with my feet pointing up while on my back. Once back into the main valley we stopped and found "the bubbletree" geocache we planned to find. (http://www.geocaching.com/) This is another great way to provide yourself with an incentive to get out there and explore. I signed my trail name to the small register and restashed the cache along with something a little extra. Geocaching has become a way for me to give back to nature in an odd manner of looking at it. Everytime I leave something with a cache I always feel like I'm paying homage to Mother Nature herself. I'm weird like that I guess. 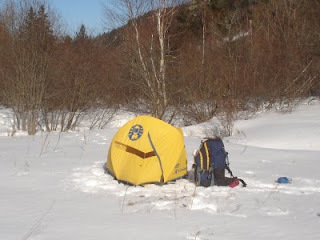 We decided to head back towards the middle meadow in the valley to make camp as it offered good open water, lots of sunshine, and flat, though snow covered, ground. We quickly set up our tents and had supper cooking. Ken had actually made chili on Thursday night. He bottled up about 3lbs of it and now was reheating it on his "Apex" stove. I went off to find some dry wood for our fire, and take some pictures and video with my camera. We finally sat down and ate around 6:00 with the sun still shining brightly into the valley. We were humbled by the honest consideration the good Lord gave us on this day, it was a truly sensational feeling to be in such a beautiful valley under such wonderful weather conditions. I should state that this is not the only time I have felt like this. I get this humble feeling alot when I'm wandering. 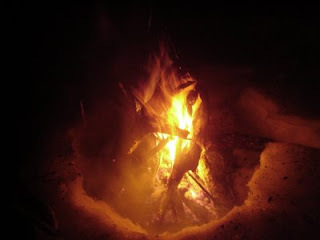 That night just before sun down a fox strolled past our campsite to check out our small fire. We sat and chatted idly about the days events, about life, about the joys of being a parent, and how lucky we were to be able to still get out and enjoy the wild areas in the Atlantic Provinces. The fire burned quietly and eventually we ran out of wood and decided it was time to crawl into our tents. Now some people may think "Tenting in the winter time is nuts" but I disagree. In winter time there are no bugs, you don't have to worry about bringing dirt into your tent, and your sleeping bag is ten times more inviting. I lit and hung my candle lantern, changed into my sleeping clothes, and then quietly wrote in my journal. I have really come to enjoy this aspect of hiking. The quiet solitude just before going to sleep is peaceful and even on a cold night in March it is warm. The next day we decided that we weren't going to have enough time to tackle Friar's Nose and so left it for another day. We had both been there before but never in winter time, so we were a bit dissappointed not to have the time to go but Ken had an engagement in Fredericton that evening so what were we to do. That just means we have to go back next winter and tackle it. The walk out of the valley was smooth and we made good time as we pushed ourselves up the steep hillside. We then crossed the ridge between Misty Mountain and Aiton Hill as we had done the day before. Today though it was quieter as we both felt a regret about having to leave the wilderness behind. 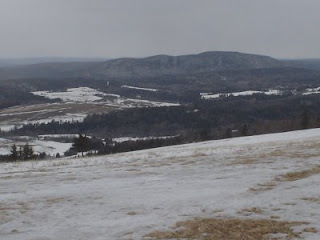 We sat along a groomed skidoo trail, below the top of Aiton Hill, to have lunch. As we ate a light snow started falling and we snickered at how quickly the Maritime weather can change. We tagged Aiton Hill and looked down into the Trout Creek Valley, the landscape a sullen gray tone that matched my mood. It was a beautiful scene with the Piccadilly Mountain in the distance, the bluff, and the vast farmland, all making it look like a painting. It almost seemed "old" like the old foundation that was in Hidden Valley, and I wondered to myself "How long will this all stay like this?" The rest of the walk was along a wooded trail I know well. I have been using it since I was a little kid. Many of the trees here have been the same since I can remember while others have toppled and fallen over. We watch as two deer jump off to our left, the white tails blending with the snow that is now falling quite heavily. This is the last leg of the trip and now our thoughts are shifting to our families and we once again are excited to see them. For me this trip spoke of time and the changing of seasons, life, and history. It also reaffirmed my belief that in this portion of New Brunswick we have some amazing scenery and natural landscapes that we need to look out for. Places such as Hidden Valley are rare and it is currently being threatened by logging impacts which are segregating the valley ecosystem. We can only hope that it can survive on its own. I am confident that it can, as I know in the past it was home to farming, and that the plateaus of this valley have been logged before, so with some good management I will be able to get there again.